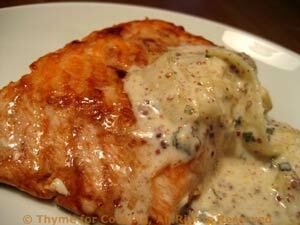 Salmon with Mustard Cream, Thyme for Cooking easy gourmet recipes. While avocados of some variety are available all year, they start getting plentiful and inexpensive in the spring - just in time for our yearning for salad. Plus, we're starting to see the first early radishes. 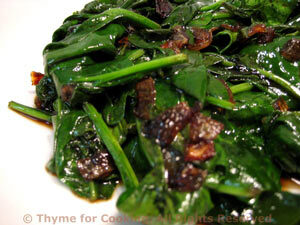 This is a simple salad, full of heart-healthy fats. 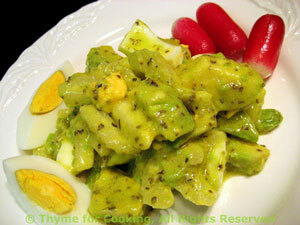 The vinaigrette blends with the avocado making the dressing thick and creamy, coating the celery and egg. Slice the celery on a diagonal to get nice big slices. Cube the avocado and scoop it out of the shells. Peel the eggs. Roughly chop one and quarter the other. Combine avocado, celery and chopped egg in a bowl. Add to avocado and toss, gently, to combine. Arrange the salad on two plates. Put 2 quarters of the egg on each plate and serve. 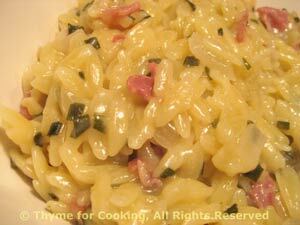 Garnish with radishes.